Seeing the bright orange, turquoise teal blue, atomic starbursts, Mid-Century Modern lamps, sputnik wall clock and 1950s furniture, was all it took for Pinups everywhere to desperately need the new MCM Furniture novelty print skirt in their wardrobes. It sold out almost immediately!! It is truly perfect for the Rockabilly event Viva Las Vegas and of course, everyday wear. 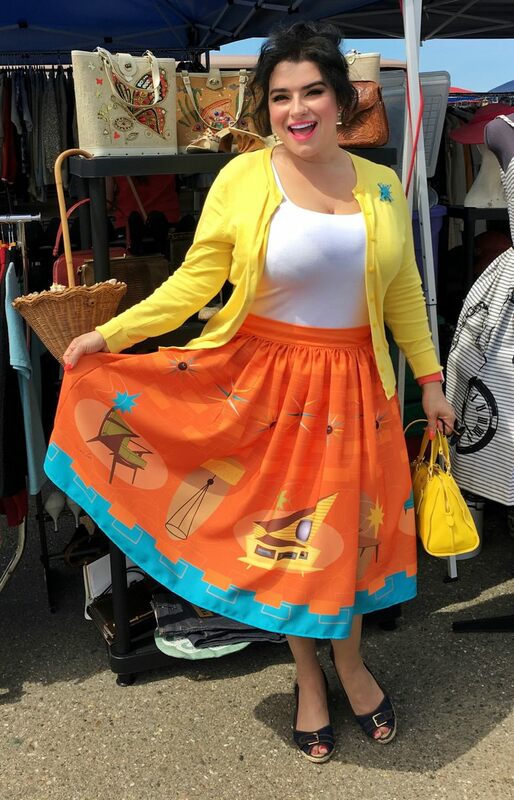 The novelty print Pinup Girl skirts from The Oblong Box Shop are all designed and drawn by Denialle Von Fitch in her colorful, witty, happy style. The prints have lots of brilliant colors and pair easily with many tops. The skirts have an extra 1” inch on the waistband so you can move the button over, thus ensuring a perfect fit as the skirts fit very snug having no stretch or wiggle room. There’s even a side pocket for your lipstick or phone. Skirts are made from 100% polyester and I think it is great because they do not wrinkle and hold up incredibly well for all day wear and travel. 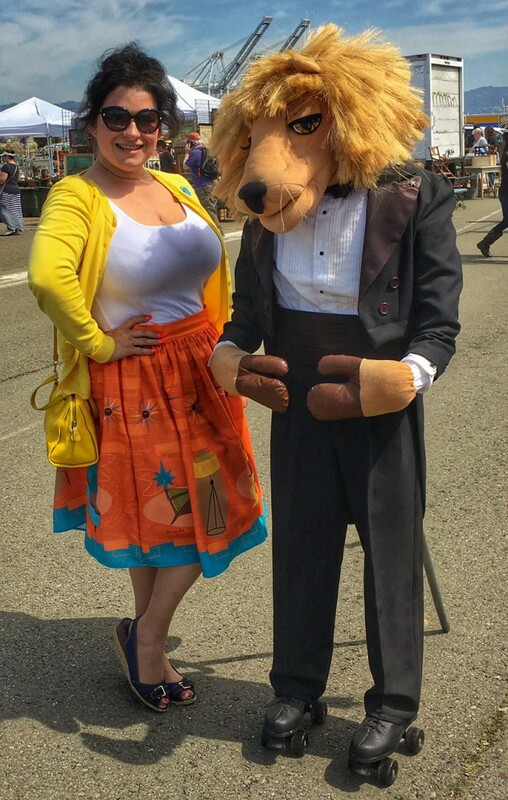 I recently got to wear my new MCM Furniture print skirt on a all-day antiquing excursion that is known as the Alameda Point Antiques Faire held the 1st Sunday of each month and has over 1,000 booths and is located just a little south of San Francisco in the city of Alameda. I usually wear a XL in these specific skirts and find the fit is indeed very snug as the fabric does not stretch. This time, I went with the 2XL and it was very roomy in the waist so, instead of moving the button forward 1” inch, I will move it backwards and see if I can get my perfect fit. I sure could have put on a wide belt with it but I thought I’d rather be comfy for a full day of antiquing. The day was lovely and sunny with a light breeze. I paired the skirt simply with a white tank-style top and yellow cardigan. My yellow purse matched perfectly and my comfy Ralph Lauren shoes worked out great. I received so many compliments, smiles, looks of admiration as hubby and I walked from booth to booth and aisle to aisle looking for goodies. 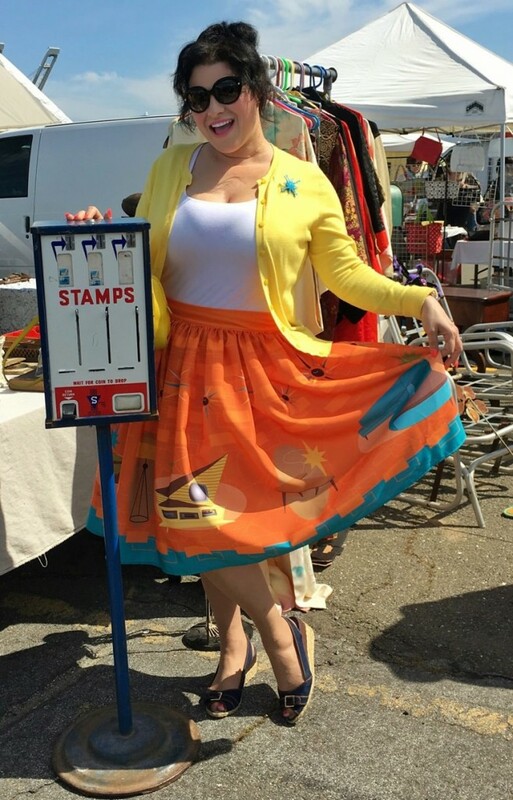 Hubby snapped some pics and the one where I am standing next to the vintage stamp machine got so much attention as folks thought I wasn’t real, they thought I was a mannequin!! How awesome is that!!! The brilliant colors on the skirt are an eye-catcher and you will be smiling ear-to-ear. Skirt is so comfortable too. I added a very light petticoat but a fuller one would really look great and make the skirt puff out a bit to really show off the great novelty print. 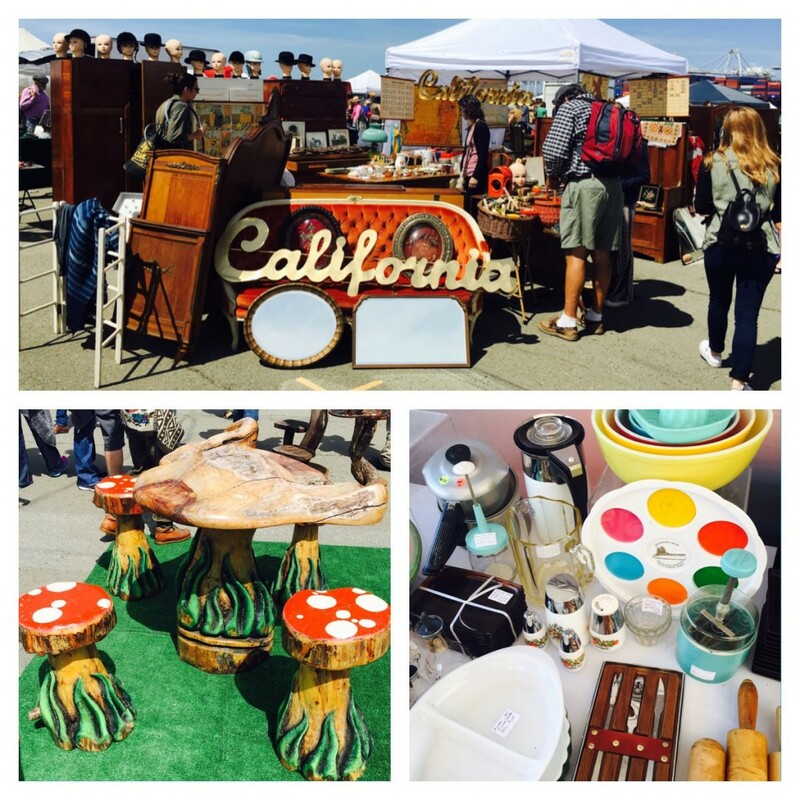 The Alameda Point Antiques Faire did not disappoint. It is on the 1st Sunday of each month event with 1,000 dealers but it was rained out for the month of March so, shoppers were very eager to get in Sunday, April 3rd. The Alameda antique fair has so much to see and look through, there really is something for everyone from vintage kitchen ware, ephimera, furniture spanning the 1800s to the 1980s, collectibles, yard décor, cameras, tools, clothing and accessories, Bakelite, storage, upcycled items too, and lots of kids toys and all sorts of goodies. I snapped a pic of this neat set of carved wood mushroom stools and table. We also ran into blogger/crafter extraordinaire Magpie Ethel who made the trek all the way from Portland, Oregon. Magpie Ethel is such a fun personality and crafts are amazing. Oh, and the food trucks at this show are fantastic!! Lots of yummy foods from giant sausages, BBQ, burgers, Asian, and more are available so you won’t go hungry and also plenty of opportunities for cold beverages too. Next show is May 1st! !